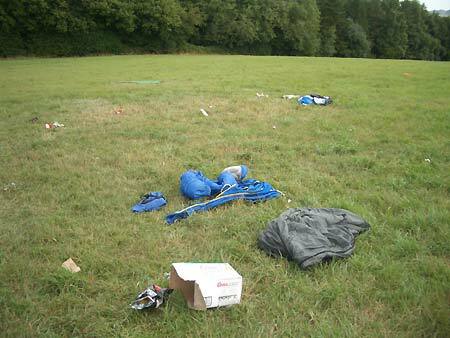 "A couple of weeks ago, some children had a camping party in one of my fields, near a public footpath (without my knowledge) and left a bin liner - and a pillow! - near the stile on the footpath. The rubbish consisted mainly of empty beer and cider bottles, and when they did not return to pick it up, I carried it home and disposed of it. Yesterday evening (21st August) I was alerted by a neighbour that a large group of young teenage children, armed with camping gear and a large supply of drinks, were heading up the footpath towards the same field. I went to meet them, and found them setting themselves up in the field. One, if they wished to come again, they have the courtesy to ask permission first, and the second, that they leave no litter behind them. They agreed, some of them even said thank you. Imagine my disappointment on finding the scene shown in the photographs this morning. 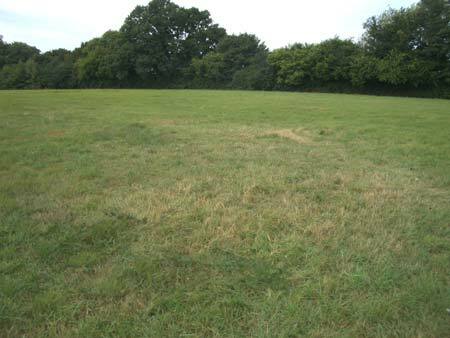 . . .Happy to say, I went up to the field to clear it all up this morning - and it's gone! Just a few outlying beer bottles in the grass, but otherwise, immaculate. Hooray!